Did you know today is National High-Five Day? Allie: Oh Mother, I'd dearly love to give our visitor a high five - do you think he'd mind? Look! It's a woodpecker! Mother heard it knock-knock-kocing on a dead branch up in our huge oak tree. Waaaay up. As in, with her normal zoom lens, this was as close as she could get to it, while fully zoomed in. He's circled in red, and you can see by the long rectangle we've highlighted, this guy's been busy drilling! Mommy wanted to play connect-the-dots with the photo! So she ran inside and grabbed her manual 200mm prime lens (no autofocus, eep!). He's really good at camoflage, isn't he? Allie thinks he looks delecta--- uh, very nice. And in this last photo you can see the top of his red head! 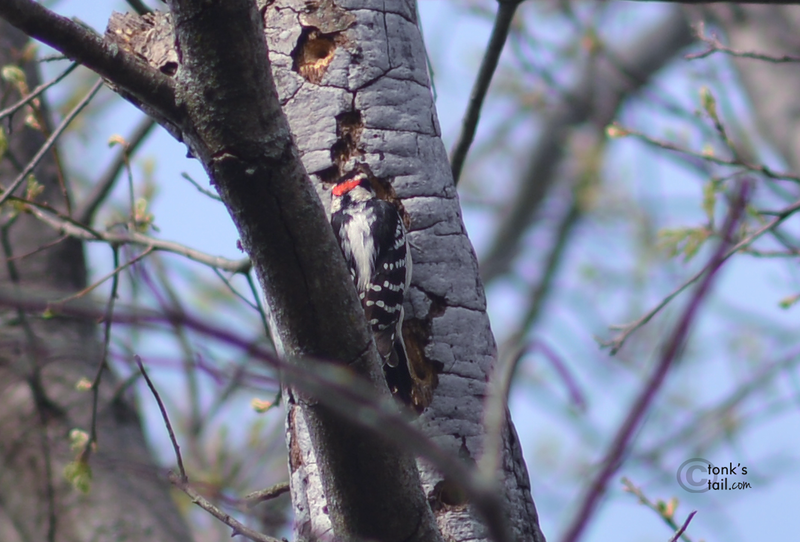 (Or were there two woodpeckers?? These were taken about half an hour apart, in two 'sessions'. 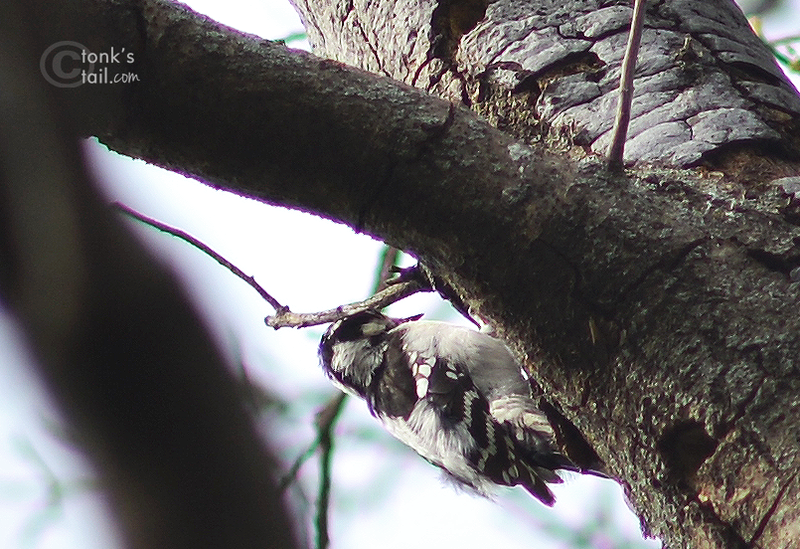 And a high-paws to the woodpecker too! He is really cute! Those are some really impressive photos for being so far away. 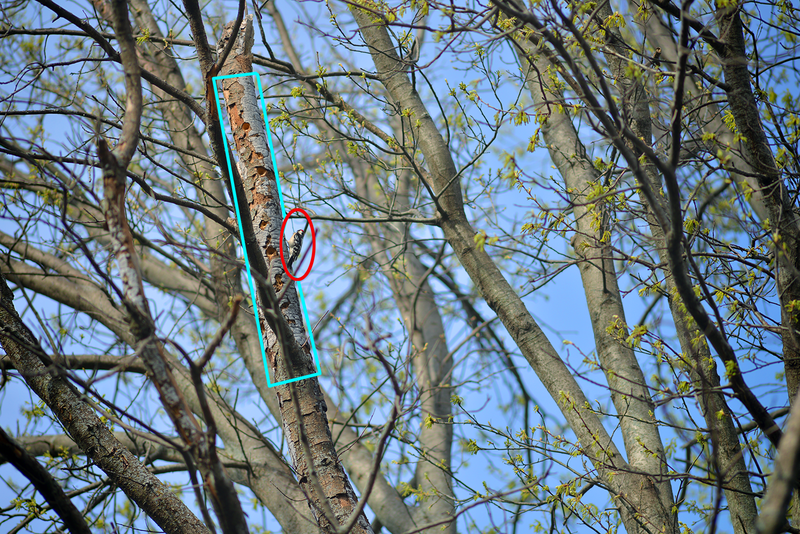 I noticed yesterday that the woodpeckers have been after one of my trees too! It's okay, Allie, you can say it....we agree - we think they look like tasty snacks! 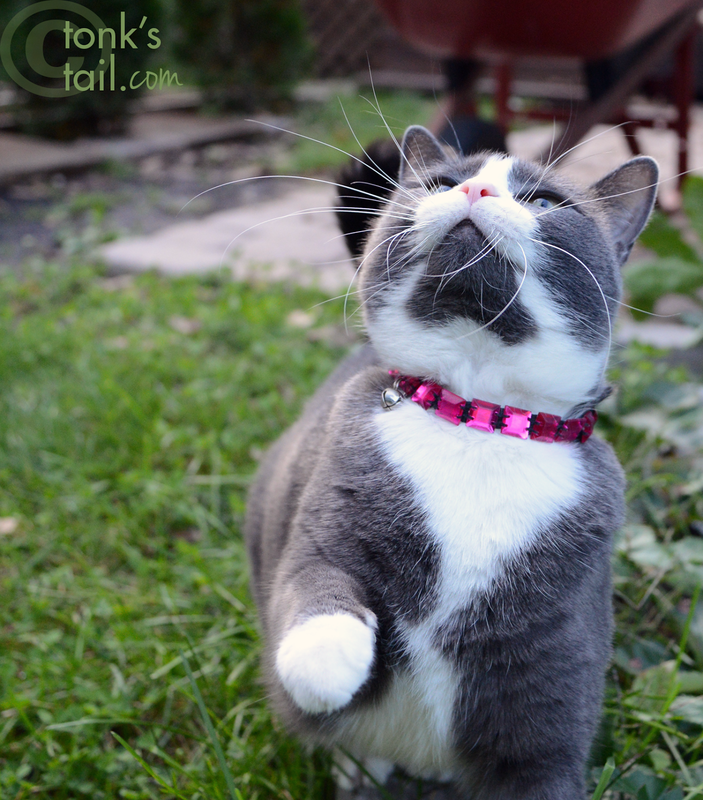 Great shots mum... high five to you. Awesome photos! Dude really knows how to drill those holes! Wow, that was intense zoomifying! We have three types of woodpeckers here, and Dad has a special peanut feeder to help attract them. Your guy seems to have done some real pecking on that tree! Ours just seem to give small pecks and finding insects. I wouldn't high five that woodpecker- did you see what he did to that tree? N heerz sum high fives for ewe N maxwell & faraday !! He's cute! Happy hogh paws day! Giving a woodpecker a high five? I think that's a GREAT idea! Mom got great shots Allie. 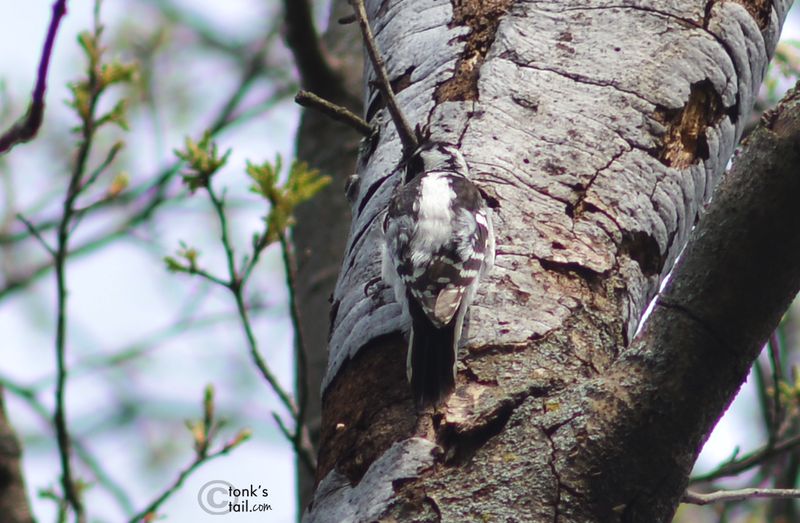 We has a wood pecker in our yard - looks just like yours does. 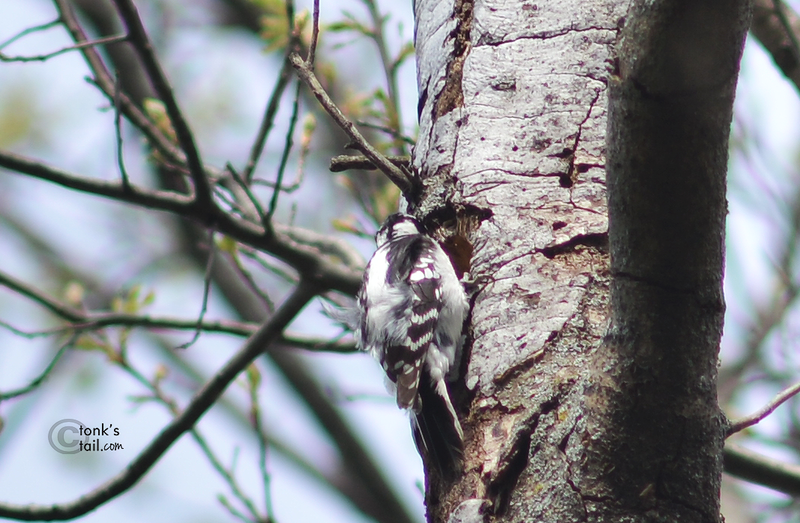 M thinks it's called a Downy Woodpecker. A redheaded woodpecker is much larger and you don't often see them in a city lot. Yours has really drilled a bunch of holes in that tree - YIKES! I think your mom's photos look great! I sometimes here a woodpecker over here, but haven't lately. What a nice visitor! They are QUITE brilliant !!!!!!! Our stupid broadband which is now slower than dial up will only load the first 2 photos. I don't think he wants a high five from you Allie but it is worth a try. We hear them in the mornings on our walks, but haven't seen them. I'd like to smack, errr, high-five, Woody Woodpecker too. How cool! We haven't had a woodpecker visitor here in many years, but when one tried pecking on the metal downspout just after dawn in the morning, the humans weren't interested in taking photos. Can you believe it? Hey! Ws got those birdies at our house too! does yous thinks they is the same ones? 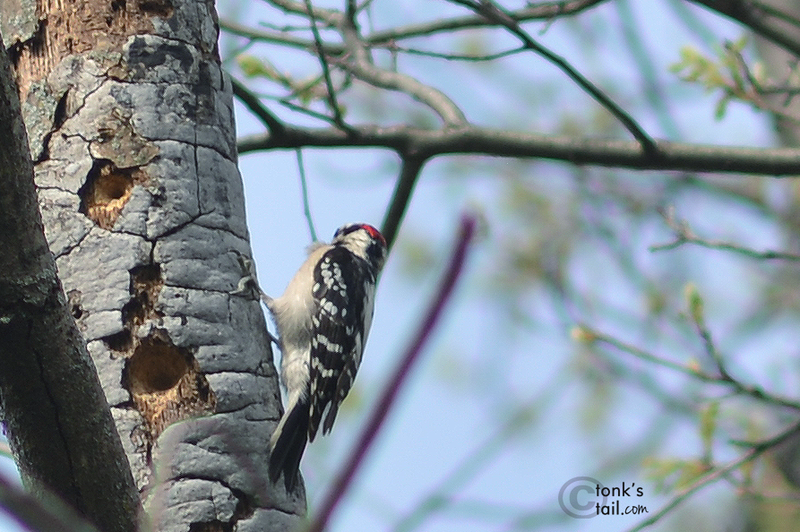 Wow, that woodpecker looks really busy drilling! They are very cute with adorable red head. Only, I wish they don't drill our deck!